Local cryptocurrency centered on an university will be commercialized for the first time in South Korea. Not only can it be used at restaurants and stores within an university, but it can also be used at business areas within 4km of radius from an university. 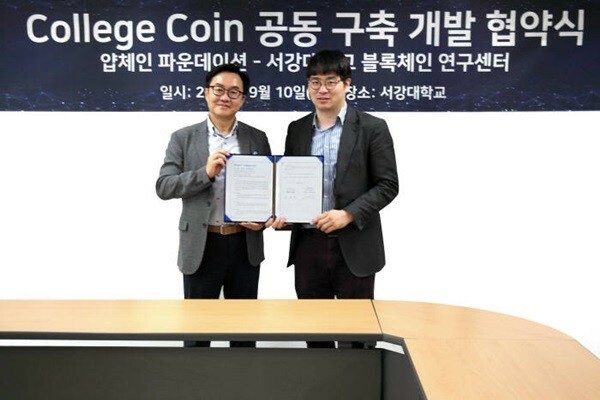 YAP CHAIN Foundation (CEO Park Sung-jae) and Sogang University's Intelligent Blockchain Research Center (Director Park Soo-yong) signed an agreement to develop blockchain-based cryptocurrency system 'College Coin' that can be used at an university. YAP Chain Foundation and Sogang University's Intelligent Blockchain Research Center are going to exchange information on R&D, perform co-research programs, exchange research personnel, and establish foundation. They are going to develop College Coin and push for new businesses based on College Coin. College Coin will be South Korea's first blockchain-based cryptocurrency centered on an university. It can be used to make payments or make wire transfers through QR Codes and it will also support barcodes and NFC (Near Field Communication) method. It can be used at restaurants, bookstores, cafes, and dormitories within an university and at stores within 4km of radius from an university. Profit will be returned to an university and its students. Eventually, it will be used at street stalls without POS terminals and university festivals. YAP CHAIN Foundation is planning to expand its business towards real estate-related business and funding support so that every participant can coexsist in a blockchain ecosystem. They are planning to carry out pilot services at many universities before a new semester starts. "Starting with College Coin, we are going to establish an environment where cryptocurrency is used as local foundation instead of as a future technology." said CEO Park Sung-jae of YAP CHAIN Foundation.